With Melodiya continuing to reissue chunks of its historic catalogue lovers of Russian music are in for a treat. This two-CD set from Evgeny Svetlanov and his USSR State Symphony Orchestra groups the essence of Alexander Borodin’s symphonic work. Although recorded over some twenty years, between 1963 and 1983, Svetlanov’s survey shows remarkable cohesion in approach and result. All titles considered here have been released several times, yet Borodin isn’t particularly overrepresented either on disc or in the concert-hall, making this nicely packaged twofer very welcome. Incidentally, Svetlanov went on to record another Borodin Symphonies cycle for RCA in the 1990s, but this older Melodiya set is by all means preferable. 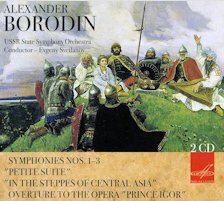 Categories: CD reviews | Tags: Alexander Borodin, Evgeny Svetlanov, Melodiya, Russian symphonies, USSR State Symphony Orchestra | Permalink.